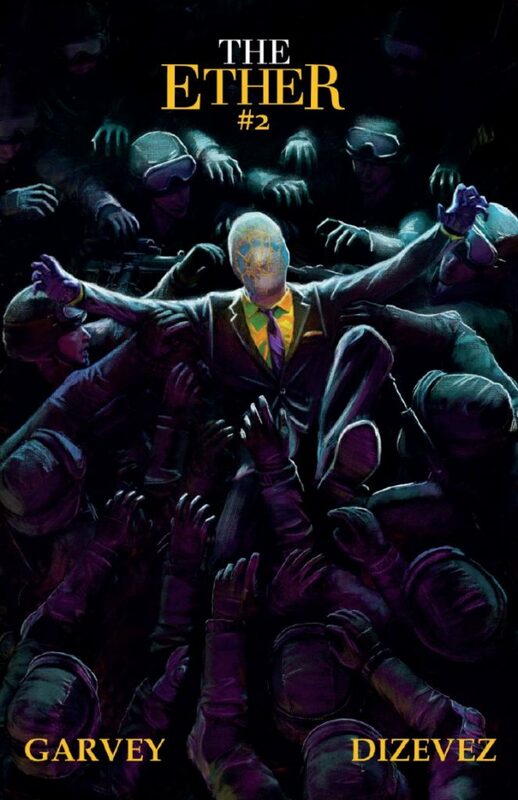 I was hugely impressed with the first issue of Garvey and Dizeves’s Ether (reviewed here), an unusual Indy superhero tale that started out looking like a lot of other similar tales (right down to a suited, masked vigilante character who at first is very reminiscent of Watchmen’s Rorschach), only to then blind-side me with a twist I wasn’t expecting, and making me realised Garvey and Dizevez has quite deliberately set the first few pages up to look like previous comics to lull the reader into one direction then hit them side-on. It was, for me anyway, a very effective method. And it was a twist I simply couldn’t mention when I reviewed that first issue because it would have involved a major spoiler which came after the mask came off – frustrating as I really wanted to mention it, but knew I couldn’t! Well I am giving fair warning here that in order to talk about the second issue I’ll be mentioning some of that twist from the first issue – so if you haven’t read it yet and don’t want to know in advance, just take my word for it that these are bloody good comics and well worth your time and support, for everyone else the review continues below! Our masked vigilante seemed very Rorschach for much of the first issue, a feared figure by the underworld, the police not exactly happy with those activities either (a world-weary detective at a horrendous crime scene – a child killing – points out he should have his officers arrest Ether). It was only in the last few pages that the mask was pulled away – literally, as our hero/anti-hero returns home after a very long, disturbing and violent night, removing the mask and suit to reveal a slim, androgynous woman greeting her girlfriend. I really hadn’t expected this, not just the gender (perhaps me showing a gender bias in that I simply expected it was indeed a man under the mask and sharp suit) but also the humanisation of Ether, or Sophie as we now know her to be. This is where she diverged sharply from that Rorschach-like vigilante writer and artist had lead us to believe she was – yes, she is clearly damaged by something to do what she does, but she shows far more emotional, human depth than the single-minded Kovacs. 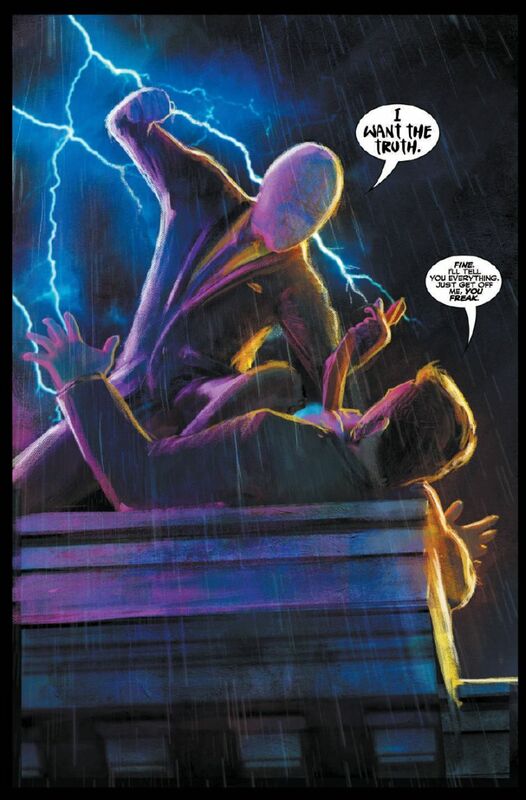 In fact I think the humanity on display through the first issue was one of the aspects of Ether I found most appealing, and that applied to smaller characters like the weary police detective as well as the main protagonist, and it gave the whole thing much more emotional impact than I had been expecting. 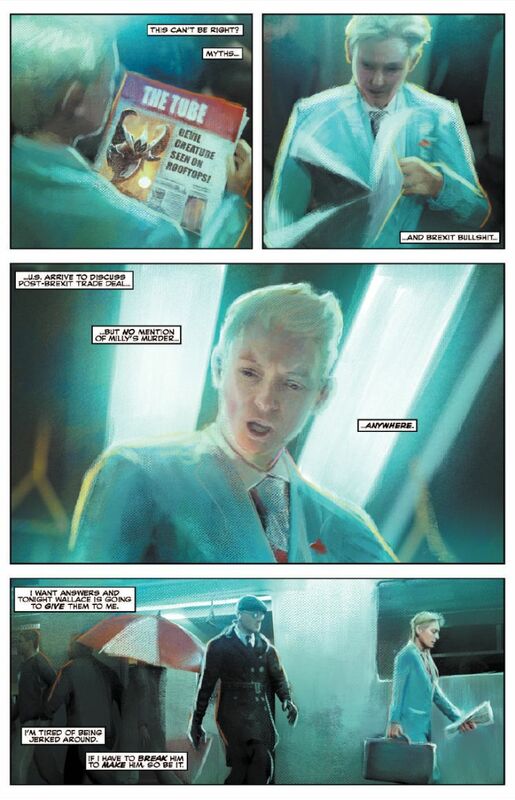 That emotional element continues right from the opening of the second issue, with the Morning After The Night Before – Ether has swapped her sharp vigilante suit and mask for a brighter but equally sharp business suit (no mask, or as with many superheroes, perhaps the mask is their real face and the face itself is a mask? ), and is acting like nothing has happened. Meanwhile her girlfriend Rubi is clearly upset, slumped over the breakfast table (some fine body language in Dizevez’s art conveying her emotions without words), as Sophie is all breezy, ready for the regular work day and pretty much oblivious at first to Rubi’s feelings, until she finally realises how upset she is, how frightened of this other vigilante life Sophie is leading, how dangerous it is. It’s a short but beautifully-handled scene – how would we feel if the love of our life was secretly risking their lives night after night? How would we feel if we knew that no matter how much they cared for us they simply wouldn’t walk away from that dangerous life? Garvey and Dizevez take that emotional aspect I loved in the first issue and ramp it up here. There’s a lot more here, layers and conspiracies behind the crimes Ether is investigating, with the promise of more to come (some of it nicely riffing on current events, some of it hinting at some dark events from previous decades that the Establishment covered up so shamelessly for years), and some more gut-punching emotional moments too, but I just can’t go into those without risking spoilers. Suffice to say the first issue took me by (delighted) surprise, and I have been looking forward to the next instalment for too long, but when it did come, oh boy, it hit all the right buttons for me in terms of character, story and emotion. Dizevez’s art is again impressive – I love his depiction of Sophie (sans mask), this almost angelic, androgynous woman who looks like Tilda Swinton and David Bowie had a baby together, and again there are some lovely small touches, like Sophie on the packed Tube, ensuring an oblivious bloke doesn’t just take the last seat when a pregnant woman is standing (not all heroic acts are huge or committed by masks at night). Emotional depth, a story that is developing more complexity with hints of more to come, lovely attention to small details and beautiful artwork that handles the domestic, personal, intimate moments as well as it does the vigilante superhero elements, really, what more can you ask for?